Need for Speed has been a series that has had a bit of an identity crisis in the past decade. From attempting to be more of a simulation with Shift to being a fully story-focused game with The Run, it’s gone through many reincarnations. The most recent stab at the series was 2015’s Need for Speed, which was a FMV-filled arcade racer in a world where it was seemingly always night time. While I dug the kitschy live-action video, the game definitely had its fair share of issues and a lot of fans were left underwhelmed. The good news is that developer Ghost Games, which has handled the series since 2013’s Need for Speed Rivals, has definitely learned from their past games. Their latest title, Need for Speed Payback, takes a bunch of good ideas from throughout the series’ entire history, and manages to put them together into one cohesive package. Players will recognize the intense cop chases from Hot Pursuit, the captivating open world from Criterion’s Most Wanted, the car customization of Underground, and the signature arcade racing that has largely defined the series despite a few pitstops at a more serious racer. There’s one other key part of Payback that helps bring all of these elements together: story. The racing game has a light, yet very interesting, story that revolves around a group of three street racers and generally likable minor criminals. They wind up getting screwed over in the game’s opening moments (which you can watch in the video above), and that sets up a tale of revenge that requires players to take back their Las Vegas-adjace home of Fortune Valley. Each of the three character specializes in different types of driving. Tyler, who serves as the main protagonist, is the typical street racer, while his two friends are more specialized. Mac, a wise-cracking British export, loves to drift and go off-road, and Jess is a getaway driver that specializes in dirtier work such as escaping the pursuit of the pigs that patrol the city. Players regularly switch between the three, and it makes sure that the gameplay always feels varied. Whether you get into the story or not (personally, I found myself entertained by it, and wanted to learn more about the characters), it’s safe to say that it won’t get in the way of anyone’s enjoyment. The main focus in Need for Speed Payback is the racing, and the majority of my time was spent racing, not watching cutscenes. Ghost Games have found a great balance of keeping the action on the road, and the story serves to add some much needed structure to an open-world racer. Payback takes place in a fictional appropriation of Las Vegas called Fortune City, and it features the varied landscapes of the midwest. From a busy city filled with large buildings and casinos to mountainous canyons and winding roads, the different sections of the extremely large map feel distinctly different. No matter where I was at, though, the driving was always enjoyable. Be it speeding down the highway or making my own jumps out of the world’s geometry, I was always having fun while racing. 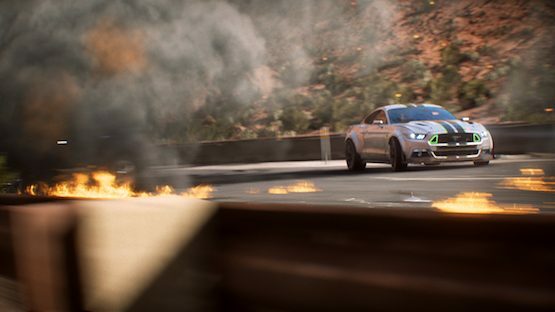 The gameplay found in Payback provides all of the action that one would expect from Need for Speed. The racing is fast, the drifting is accessible and fun to do, and players are rewarded for driving recklessly with nitrous boosts. It all gels together to make a really fun to play racer, and its in the game’s “Blockbuster” moments where things really shine. These story-based missions mark key moments in the story, and I got to play through the one seen in the game’s E3 2017 trailer. This had me taking out rival cars, and eventually highjacking a car that was in the back of a semi truck. These moments are spread throughout the campaign to where they only occur once every couple hours, and they really feel special due to it. It also manages to stay away from the mistakes of The Run, which had a penchant of focusing on it too much and taking the players out of their vehicle. I’ve largely talked about Need for Speed Payback as being a celebration of the series, and one that puts together all of the best elements into one package, and while that’s true, it also brings its own ideas to the table. One of the coolest is the idea of derelicts, which are similar to Forza Horizon‘s car barns. Rather than finding a rusted out complete car, though, players will have to find a bunch of separate car pieces scattered around Fortune Valley, and then they can restore the piece of automobile history into something special. These locations pop up while the player is driving around, and it basically turns Payback into a puzzle-platformer of a sort, as the pieces are often found in hard to reach locations that require some creative use of jumps. It’s a really cool idea that winds up being a lot of fun. 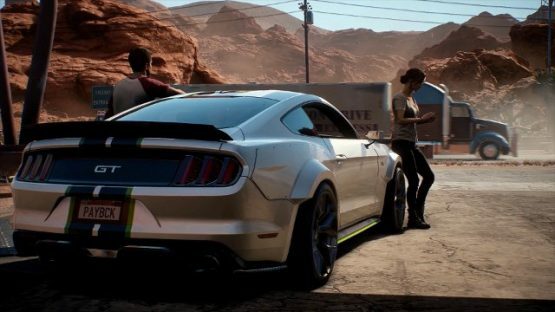 Need for Speed Payback preview conducted at an EA event. Game played on a PS4 Pro, and the preview only covers the first two chapters. The publisher provided travel and lodging.